Charles Henry Davis (1873-1956) and Ethel Herchenrath (1874-1936) married on April 30, 1900, in Franklin, Howard, Missouri. Charles worked as a dealer in general merchandise and the newly married couple lived in the house of Charle's father, James H. Davis. When their first son, Hugo Herchenrath, was born on December 23, 1902, the family had moved to 1462 Belt Avenue in St. Louis. When Phillip Marquis was born, on March 4, 1906 the family lived in 1155 Bayard Avenue. On December 8, 1907, Phil's baby sister, Emily Price, was born. "I had a mania for parades”, he says. "I drew every parade I could see. My family neither encouraged nor discouraged me; they just went along and accepted my dark fate." When Phil was 12 years old he got a summer job as a tool boy in the Liberty Motors plant. Also doing a war job during the summer was his pal's father, Franz A. Berger. He was a mechanical engineering professor at Washington University and he encouraged Phil to take a manual training course at high school. In 1918 the family lived in 5915 Minerva Avenue, and Charles as an inspector for Wagner Electric Mnfg Co.
With every hope of becoming an engineer Phil enroled Soldan High School in 1919. But in 1921, at the end of his sophomore year, his family was in financial trouble and Phil had to quit school to support himself and his family. Due to his training in mechanical drawing the 15 years old Phil got himself a job as a draftman for the tecnical department of the Bell Telephone Company in St. Louis. But Phil had a form of sleeping sickness, as an after-effect of the flu epidemic in 1918, company had to transfer him to outside work with the installation crew. His next job was for a radio concern and he got a first-class ham license (9 EDD). He worked in the radio concern, mainly with experimental research, until they demanded he invented an entirely new circuit for them. Then Phil went to Florida as a draftsman with an civil engineer and when returned he got a job in a office of a consulting engineer. With some help from his roommate he teached himself trigonometry after his work, at night. About this time he also designed a streemlined coffin for a St. Louis casket company. The chief draftsman suggested lettering as a way of selling himself to some commercial art house. Phil started teaching himself lettering at night from library books, and took a Y.M.C.A. course in showcard lettering. For a display adverticing company his first job was to letter "Merry Christmas" - 25 feet long, but he no idea how to lay it out and they had to call an outsider to do that. Phil continued to study figure painting and illustration at Washington Art School at night, and in 1928 he got a job in the Post-Dispatch Art Department. In 1929, Phil married Helen Culbertson in a small ceremony at the house of his uncle and aunt, Ralph Waldo and Florence Bugbee. The marriage in 5881 Plymounth Avenue was soleminized by Dr. William Growe, pastor of the Westminister Presbyterian Church. The bride was unattended and wore a simple shell-pink frock. She wore an arm bouquet of spring flowers, and the seremony was witnessed by a small gathering of friends. The young couple made ther home in 5316 Pershing Avenue. Phil now worked for The Triad Studios[footnotes 1] , one of the midwest's largest advertising art agencies doing advertising illustration, fashions, photo retouching and cartoons. In 1930, on March 8, their son Phil Culbertson David was born, and about this time they moved to an appartment in 5525 Enright Avenue. In 1932 Phil worked at Paragon Studio with J Hamilton Stevens, Sam M Schoke and Louis F Westbrook. Helen and Phil now had moved to 5930 Kingsbury Avenue. Phil told that the a smart guy talked him into corporating with him, Phil as the artist and him as a salesman. But Phil found that he did all the work and his salesman only pulling down half the pay. Phil now started as a freelance artist, and rented room with The Illustraters, founded in 1933 by Russel Viehman, Alf Parker[footnotes 2], Mrs Frances Deppe and Janet Lane. In 1933 Phil C became ill and just 3 days after his third birthday he died by lobar pneumonia, and later the same year Helen divorced Phil. Phil continued working with magazine covers and illustrations with The Illustraters and did a cover for the Liberty magazine in 1933, and shortly after a young man named Lee Falk came walking into his office. Lee Falk came with his idea for an adventure strip, suggesting a partnership. Phil Davis worked out the physical appearance of characters in a story, which he figured could be serialized indefinitely, and made up a two-week sample. Part of Falk’s stake was to finance his own trip to New York to try to sell it. And right away Mandrake the Magician landed in the New York Journal under the heading "Floyd Gibbon's daily page of thrills and mystery” June 11, 1934. On November 5 Phil re-married Martha Grocott Walter, whom later became the head fashion artist in Vandervoort's art department. And in 1935 (February 3) the first Sunday page with Mandrake was to been seen in the newspapers. "I didn't have any idea of the amount of work involved in a comic strip," Phil recalls. "I nearly killed myself in Mandrake's first year-working 14 hours every day, and 5 hours on Sunday besides! There's a lot of difference between taking a week to do one drawing for an advertisement - and doing 24 complete drawings for six comic strips! "Still, I wouldn't go away from my anatomically correct figures to do the faster type of cartoon illustration. Anyway, once you start a strip, the Syndicate wants it to be always exactly the same. "But all this pressure has had its advantage. By doing good art for Mandrake, I don't lose my touch, and I can always do commercial work in addition. I find that Mandrake has made me a better artist, and a much faster worker." In the beginning Phil Davis did all the artwork himself. Late 1935 Phil Davis sublet parts of the ink work to a man named Ray Moore, whom later became the first artist of the other Lee Falk figure – The Phantom. It is believed that Ray Moore worked on the Mandrake dailies from the strip printed the January 13, 1936, since Phil Davis stop signing the strips with his own name. Mondays he roughing out the six strips of dailies and one page of the Sundays. Tuesdays and Wednesdays he spent tree hours in pencilling one strip in the morning, afternoon and evening. Thursdays he pencilled the Sunday page. Fridays he spent inking in. Saturdays at noon he picks up his wife and they went to their weekend house at Big River, in the foothills of the Ozark Mountains. As assistants he had a pen and ink draftsman, to whom he sublets part of his pen work, and another part time worker (Eddy Walcher) did the lettering. From 1940 he took up his carer as an illustrator and did commercial illustrations for various companies, Coca-Cola etc. In 1941, Phil Davis received a $500 award as the winner of a medal-design contest of the American Newspaper Publishers Association ($ 500). The medal he designed was presented annually to the winner of an annual essay contest open to students of journalism on The Achievement of the Daily Newspaper in Public Service. About 1941 his wife Martha, gave up her career as fashion artist for on of St. Louis department store, to assist him in preparing Mandrake drawings. Martha had a great influence on women's costumes, those of Narda in particular. 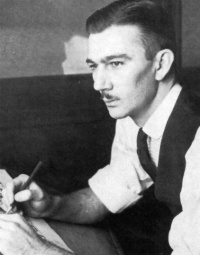 During WW2 he served as an art director for Curtis-Wright Aircraft Corp in St. Louis. He did most of the technical illustrations for the instruction book of the Curtiss A-25 Dive Bomber, and found time to write the operational data for the radio equipment used by the plane. During this time Martha sometime did the entire strip and as Phil Davis said in 1948: "And now," says Phil, "she's just as good as I am! After the war, she didn't want to leave Mandrake - so now we work together, and each of us can do any part of the job, or finish the work of the other one." In 1948 Phil Davis did his work at whichever of the places he happens to be, his studio downtown, his studio at his home or at his drawing boards in his country house. Lee Falk mailed two or three months' supply at a time. Phil studied the script, edit it a little, cut down the amount of talking the characters did (on account of space limitations) and proceeds to rough out in pencil. When he had six strips finished that way, he sendt them over to a lettering man who inked in all the lettering. Sometimes a balloon would take more or less space than Phil had estimated, and with the lettering in first, he could adjust the drawings to fill the panels properly. Phil Davis said in 1963 that he illustrated the art comprehensively in pencil and then Martha did the rendering (ink). Little are known about his life outside his work on Mandrake. But it is known that he had a complete power-tool woodworking shop in his country house, and that he did most of the cabinet work, plumbing and electrical work out there. He liked to swim in the river and lake behind his property. He did a little hunting, and played with his two dogs: Julius, a French poodle and Max, a dachshund. In 1963 Phil Davis suffered a heart attack. He died of a second attack at St John's Mercy Hospital on December 16, 1964. He was survived by his brother Hugo H Davis and his sister Emily Price Drimmel. Martha Davis continued the art for the ongoing dailies and Sundays until Fred Fredericks became the new artist on the "Mandrake the Magician" in 1965. This page was last edited on 17 September 2018, at 08:35.